The City of Glenwood Parks Department is seeking a part-time seasonal recreational employee, mowing and recreational maintenance. Applications can be picked up at City Hall 5 N. Vine St. or requested via email cityclerk@cityofglenwood.org. The City of Glenwood Street Department is looking for a part-time seasonal worker. Applicants must have a valid driver’s license & high school diploma. Mowing/weed eating experience preferred. Applications can be picked up at City Hall 5 N. Vine Street or requested via email cityclerk@cityofglenwood.org. Applications must be received by April 19, 2019 by 4:30 p.m. EOE. 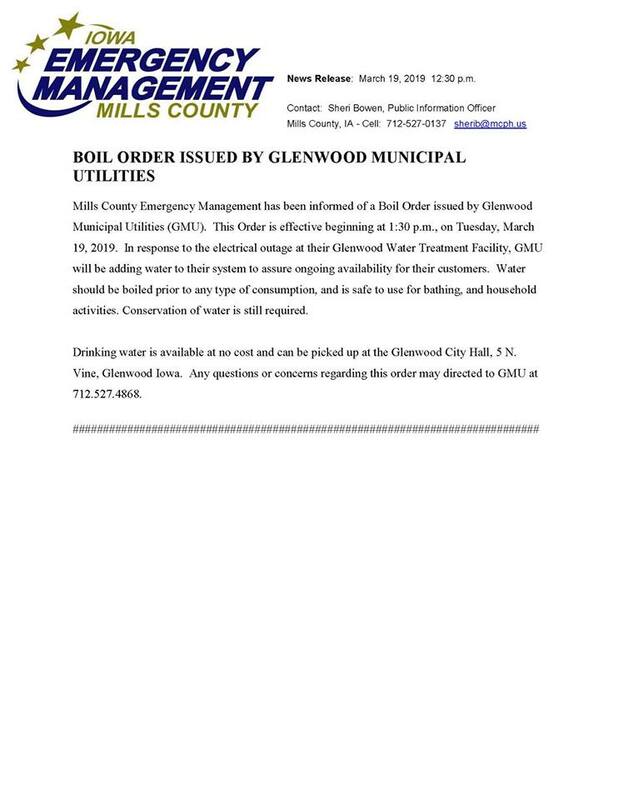 Mills County Emergency Management has been informed of a Boil Order issued by Glenwood Municipal Utilities (GMU). This Order is effective beginning at 1:30 p.m. on Tuesday, March 19, 2019. In response to the electrical outage at their Glenwood Water Treatment Facility, GMU will be adding water to their system to assure ongoing availability for customers. Water should be boiled prior to any type of consumption, and is safe to use for bathing, and household activities. 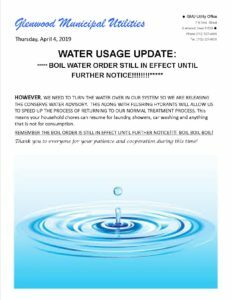 Conservation of water is still required. 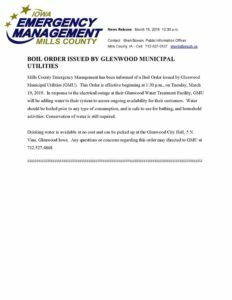 Drinking water is available at no cost and can be picked up at the Glenwood City Hall -5 N. Vine St, Glenwood, IA. Any questions or concerns regarding this order may be directed to GMU at 712-527-4868. 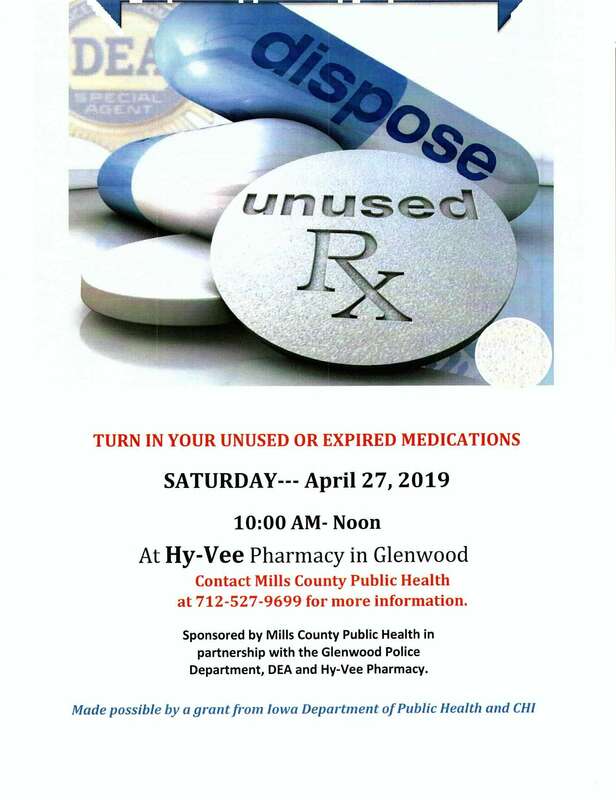 Glenwood Area Chamber of Commerce, Red River Waste and the City of Glenwood is bringing in a recycling container later today (March 19, 2019). The container will be located at the city ball fields on Vine Street, our hope is to limit the amount of plastic bottles added to our landfill. Please put ONLY water bottles into the container, if ANY trash is found in the container it will ALL have to go to the landfill!!! Please report any misuse to the Glenwood Police Department at 712-527-4844.